SAW029943 SCOTLAND (1950). Stewarts and Lloyds Ltd. Phoenix Tube Works, Dalmarnock Road, Glasgow. An oblique aerial photograph taken facing south-west. This image has been produced from a crop marked negative. Title [SAW029943] Stewarts and Lloyds Ltd. Phoenix Tube Works, Dalmarnock Road, Glasgow. An oblique aerial photograph taken facing south-west. This image has been produced from a crop marked negative. The site, give or take a few yards/metres, of Thomas Seath's shipyard at Rutherglen. He is remembered by the current Seath Road in the same area. He started his shipbuilding at Meadowside, Partick at the mouth of the river Kelvin in 1853 and in 1856 moved to Rutherglen. 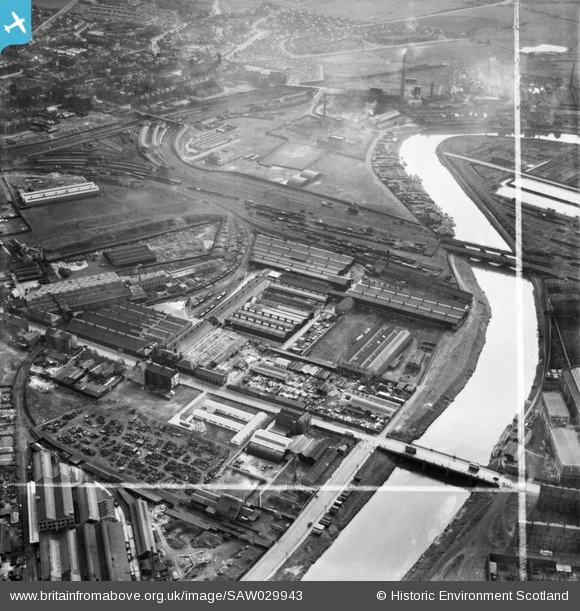 The shipyard closed after 47 years (about 1903) when access to the sea was closed off by a weir at Glasgow Green. By then Seath had built over 300 ships, an average of one every eight weeks. One famous ship was the paddle-steamer Lucy Ashton – before it was scrapped it was stripped of its paddles and four jet engines were used to power it for trials by the British Ship Research Association.